What prevents people from coming to work every day and performing their assigned functions to their full potential? Possible causes include a poor job fit, culture, management ineffectiveness, a psychologically unsafe workplace and lack of organizational pride. Senior leaders focused on productivity and the profit-and-loss statement may be more cynical about the above causes and suggest the solution is to hire the right people. While important, that alone will not guarantee productivity. Understanding why employees can or cannot be fully engaged and productive requires a new lens called “total health.” Total health is the sum of an employee’s physical and mental health, workplace experience and life that includes finances, work-life blending and relationships. Most CEOs would agree that mental health can impact employees’ ability to work to their full potential. One-fifth of the workforce on any day is struggling with a mental health issue, according to the Canadian Mental Health Association. On top of this, more than one in four workers say they are highly stressed, according to Statistics Canada. If people don’t learn to cope with stress, over time, it can increase their risk for a mental health issue, including addictions. So, what behaviours do people under stress engage in to cope and to feel better? One favourite involves food. Many people engage in snacking as an attempt to distract themselves from their stressors and to feel better. Another common behaviour is alcohol consumption. Degrees of consumption include: social, regular (a few drinks a week), heavy (at increased risk for liver disease, cancer and substance dependency issues), and males who have 15 drinks per week and females who have 10. About 19 per cent of the Canadian population report as heavy alcohol users, according to 2017 stats from Statistics Canada. After completing my postdoctoral studies in behavioural science and a book series on addictions with John Wiley & Sons, the one thing that sticks in my head is that most people with alcohol abuse and dependency issues are not on skid row — they go to work each day. One challenge with alcohol consumption is it’s socially accepted, and often part of social and recreational activities. Many consumption levels match the social group they engage with. One frightening statistic found in our total health research is that 11 per cent of employees have driven a motor vehicle while under the influence of alcohol in the past year. The lowest risk for all causes of mortality due to alcohol is when a person does not exceed five to six drinks a week, according to a 2018 analysis of the risk thresholds for alcohol consumption in the Lancet, reviewing 83 prospective studies. The Total Health Index asks two questions: What is your typical number of drinks per week? On the days you drink, how many alcoholic drinks do you consume? The THI findings align with the Lancet study, suggesting that drinking less is better for your health. With more drinks, the THI index score declined. A free, confidential online tool that employees can use to screen their risk for alcohol and other addictive disorders is an Addictive Disorders Screen (ADS-10) at www.howatthronline.com/quicksurveys/adsintro.a5w. Employees whose profile is at risk are encouraged to seek professional support to discuss their risk profile. The above chart outlines an overall alcohol consumption risk profile. When creating mental health strategies, HR leaders often neglect to consider substance abuse or dependency — and the connections to people with mental health issues. Educating employees on the risk factors, signs and symptoms, and setting safe guidelines, are important considerations when designing mental awareness communications and campaigns. When developing a mental health strategy, HR leaders are advised to also talk about addictive disorders risk. Human resources leaders can play a role in curbing risk by assisting employees to become self-aware, take accountability for their health and make healthier decisions. 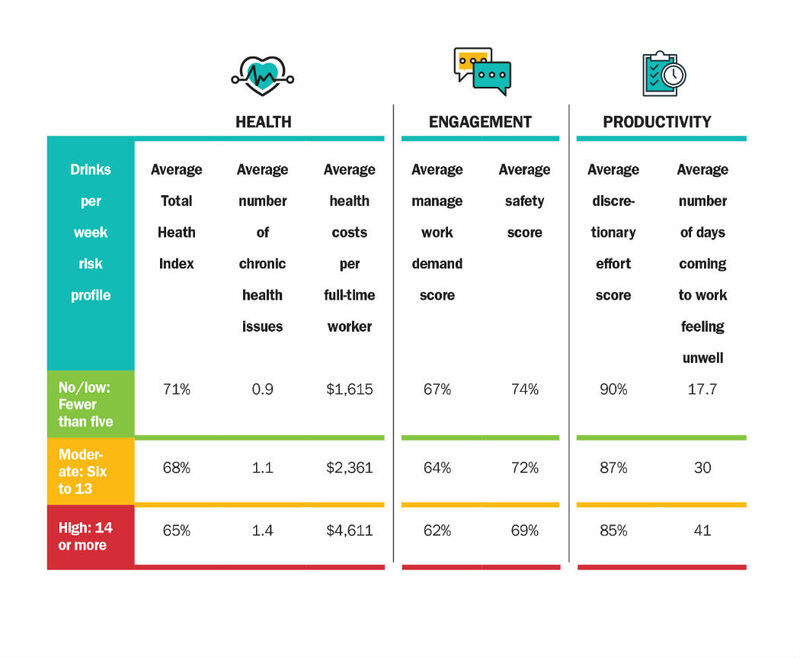 The Total Health Index provides evidence of the value of educating employees on the direct relationship between alcohol consumption and total health. It’s about influencing employees to make better micro decisions on alcohol consumption. The index can help educate employees on their degree of risk, as well informing employers on how much impact alcohol consumption is impacting workforce health, engagement and productivity. Bill Howatt, Ph.D. Ed.D., is the chief of research and development, workforce productivity, at Morneau Shepell in Toronto. For more information about the Total Health Index, visit www.morneaushepell.com.